Paddleboarding has begun picking up steam in recent years. It’s an outdoor sport that has a low barrier for entry and can be enjoyed by all age groups. It’s always nice to have another excuse to go outside. In recent years, the sport has been made even more accessible with the introduction of ISUP (inflatable paddle boards). They are cheaper, easier to store and are a better alternative for beginners. That said, there are a lot of them out there, some built towards surfing, white water riding etc. It can be a bit confusing. In our guide today, we introduce you to the world of paddleboarding and describe to you how to pick the best paddle board for your needs. After reading our guide, you’ll have a solid idea of what you need to look for in them. 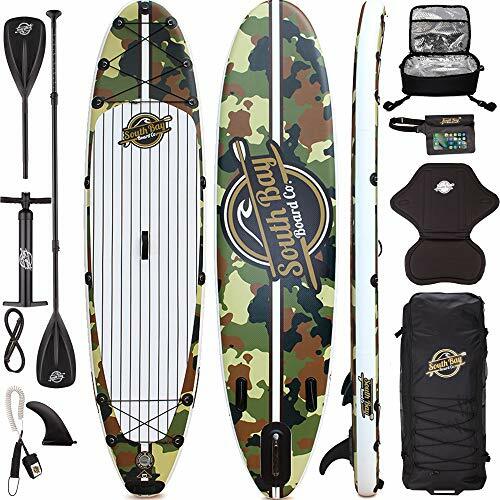 The SBBC Ultimate Deluxe Package is an inflatable SUP that comes in at 10 feet 6 inches in length, 31 inches in width and 6 inches in thickness. It’s a great option for all skill levels, particularly beginners. It can support up to 350 lbs in weight and is made up of durable military grade PVC, with a dual-layer for extra durability and strength. The dual-layer allows it to still be a bit soft, so it’s a good option for SUP yoga. 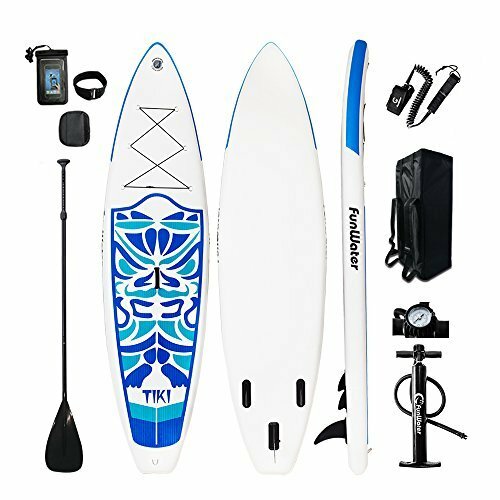 You don’t get the best value for your money with this package when you consider the quality of the paddleboard and paddles. However, the accessories are pretty good. They can add a lot to your experience, but only if you will make use of them. You also need to consider that you are paying a premium price and whilst a cooler is nice, it’s not worth that. A lot of useful accessories – a waterproof fanny pack can help with storing food, books, notes etc. The Thurso Surf Waterwalker is around the same price range as the SBBC above but offers an alternative when it comes to accessories and easily has the best paddleboard construction on my list. At 10 feet 6 inches in length, 6 inches in thickness and 32 inches in width, the Thurso can hold 300L of air and weighs a maximum of 26lbs. You can also pick a slightly longer one that is 10 feet 11 inches in length. This paddleboard can support up to 330lbs (or 450 lbs for the longer one) so two people could ride it at once. It has a quad-layer PVC construction that they quote to be nearly indestructible. Whilst we wouldn’t bet on that, you can expect this board to last a long time. Though it might be too stiff for some people. The paddles are made from two different materials, with the shaft from Carbon and the blades from composite nylon. The combination allows them to be lightweight and strong. It comes with 3 removable fins that can be used differently for various conditions and various riding styles. The other extras that come along with it are a coiled leash, a cooler, a hand pump and a comfortable backpack. A bit on the costly side, one of the most expensive options on our list. 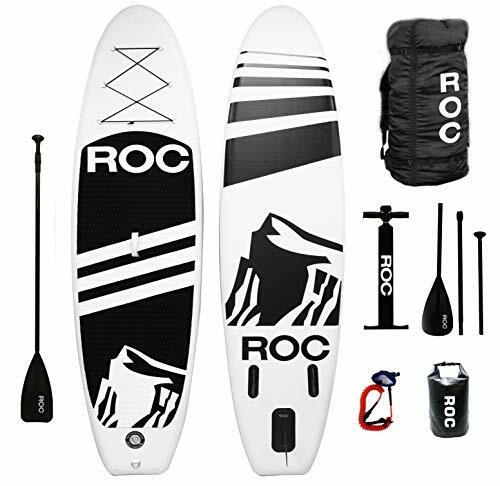 The RoC Paddle Board comes in at 10 feet, 5 inches in length and 6 inches in thickness. It’s affordable and is a good option for beginners on a budget. It can hold up to 350 lbs in weight depending on how much you inflate it. Speaking of inflation, the valve on the board can leak and cause you to spend loads of time trying to fill it up, something to watch out for. The SUP comes with a paddle, a hand pump, a leash, a backpack, and a waterproof bag, so the basic, but necessary accessories. The paddle is made from plastic but it has foam inside that allows it to float so you won’t lose it if you drop it in the water. The accompanying backpack is also well padded and is fairly comfortable to use over a long period of time. We would recommend this if your paddling spot is a bit out the way and requires you to walk some distance out. However, the SUP doesn’t come with a manual which will make it a bit difficult to put together if you don’t have experience with other paddle boards. If it doesn’t float your boat, check out the Bluefin for something similarly priced but slightly better. Leaky valve, we’ve heard that a lot of boards have experienced valve issues. Enough that yours probably would have an issue. 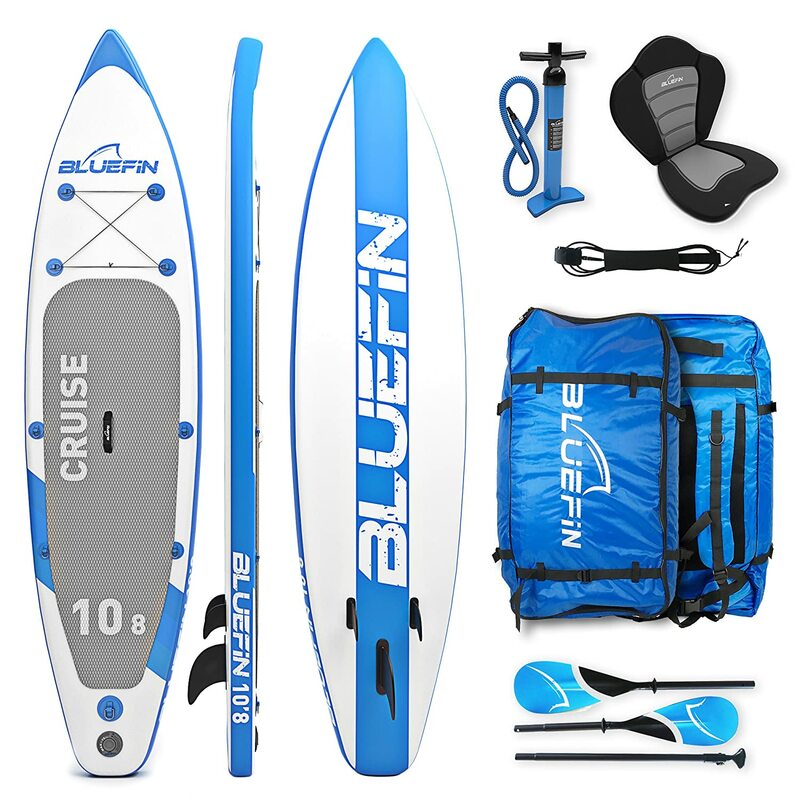 The Bluefin Paddle Board is our medium priced offering. It weighs a total of 33 lbs and it comes with a triple-layered PVC construction, meaning it will be both durable, strong and a bit stiff. We would recommend it for some white water use or for someone simply wanting something stiffer. The SUP is available in 15 feet,12 feet and 10 feet 8 inches in length. The longer lengths are better long distance touring and the shorter ones for surfing and other all-purpose exercises. 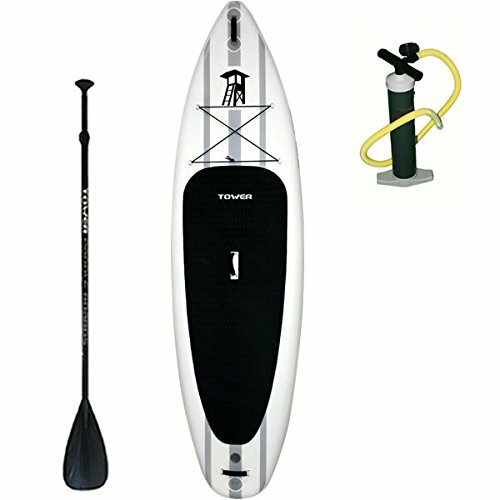 It comes with a long tethered cable, a kayak seat, a backpack, 2 and a half paddles, a single detachable tracking fin and a high-pressure dual pump. The dual pump will be the best and easiest to use out of all the pumps on this list. It will make filling up the paddle board easier and faster. We suggest beginners stick to the 10ft 8in paddle boards for the best experience, but bigger riders may go for the 12 feet ones. The quality of this board is mainly focused on its limited accessories and on the board itself. If you simply want more accessories, the Thurso or RoC are good alternatives. An affordable option with a decent selection of accessories. Dual pump for fast and easy inflation. 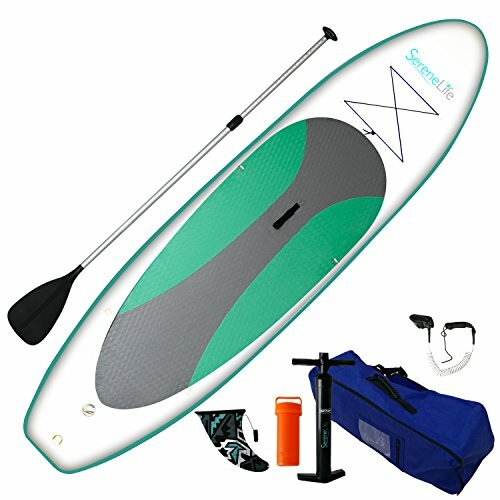 The SereneLife Paddle Board is similarly priced to the Bluefin but doesn’t work as well. The SUP is 10 feet long and 30 inches in width and is built mainly for surf and choppier water. We wouldn’t recommend it for flat water riding because it’s 3 fins aren’t removable. This means it will feel wobbly or twitchy in the water. Otherwise, it is constructed pretty well so most of the quality (and cost) comes from the construction of the board. However, it doesn’t come with a lot of accessories but it does have a a pump, a leash, a storage bag, and a repair kit. If you don’t mind missing out on a kayak seat or an ergonomic bag, this option might suit you. However, we would be hesitant to recommend it because it isn’t the best value for money when you consider our other options. If you aren’t satisfied, check out the RoC or Bluefin boards for an alternative within a similar price range. Lightweight at 30lbs. It will be easy to carry around, but we recommend you get a different bag than the one that comes with it. It features a dual pump which means it inflates really quickly. The budget option, the FunWater Paddle Board still comes with some creature comforts making it a worthwhile option (and even better than some others on the list). The ISUP itself is fairly decent, it’s made with dual layer PVC, allowing it to support up to 330lbs. It measures in at 10 feet 6 inches in length, 33 inches in width and 6 inches in thickness. Some of the accompanying accessories include a high-pressure pump, a travel bag, a coil leash, a repair kit, a waterproof bag, and 3 removable fins. The paddle is made from aluminum, which will mean it will sink if you let it drop in the water and the 3 removable fins mean you have some customization over how you want your board to ride. Finally, it comes with a 60-day guarantee and a 1-year warranty on the materials. The package definitely sacrifices on some articles (like the aluminum paddle) and warranty, but it features a high-quality dual-layer board, removable fins, and as many other accessories as other boards on this list have to make it a competitive option. Removable fins allow for loads of customization and preparing your board for the environment you want to ride. Travel bag allowing for easy transportation. The heavy Aluminium paddle allows the package to be affordable, but it also means you can easily lose the paddle if you’re not careful. The Tower Paddle Board is in competition for the best board on this list and would be if it was slightly cheaper. It comes in at 10 feet 4 inches in length and 32 inches in width, perfect for beginners with extra stability due to that width or for bigger riders. The board is made from a dual-layer of PVC so you can expect it to be rigid and to withstand knocks here and there. It comes along with a fiberglass paddle, a high-pressure pump, a grooved deck pad (for extra grip), a removable center fin and a roll-up carrying strap. However, it doesn’t feature a backpack so it won’t be easy lugging the deflated SUP around, it’s not the option if you’ll be chasing after lakes that you have to hike to get to. Check out the Bluefin for a similarly priced option with a different array of options (like a bag). Finally, it has a 2-year warranty (which doesn’t cover wear and tear) and the removable center fin opens it up to some customization. 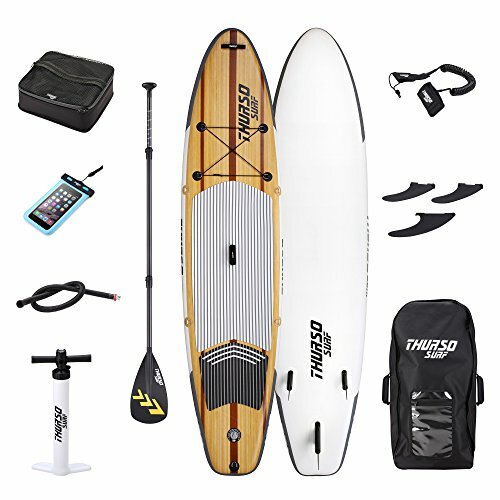 I would say this package isn’t the best but is great for those who want a high-quality board, paddle, and pump because Tower has not compromised at all on the price of those things. It is on the pricey side and you should be able to get a bag in that price range. What Makes a Paddleboard Set Up Worth the Money? As you’ve noticed, we’ve decided to primarily focus on inflatable paddle boards. We think they are better value for money, especially when it comes to beginners. You can find out more in the section below this. The inflatable paddle boards are basically made from layers of PVC woven together. You can get boards that have single, double, triple and even quad layers of PVC (like in the case of the Thurso). Most boards you see will have a double-layer at the least, as single layers will be too weak and inconsistent for use as paddle boards. Generally, the more layers of PVC you get, the stiffer your board gets when it is inflated and the more durable it will be. It will also be a bit more expensive with more layers. These basically tie to your ankle and allow your paddle board not to float away when you fall into the water. They come in two types; the coiled leashes and the standard ones. The coiled ones coil up when you’re paddling and stay out of the way, whilst the standard ones just hang about (dragging in the water sometimes). Really a matter of personal preference which you pick. They also come in varying lengths, with the longer ones allowing your board to float further so it doesn’t hit you (in choppy conditions) and the others keep it close. A removable fin allows you to customize how the paddle board will feel in the water. It also allows you to customize how appropriate your paddle board will be for various environments. For example, the two small fins featured on most SUPs are there for sideways stability and basically stop you from constantly spinning out. Two fins are more than appropriate for flat water riding as having all three will create drag, ultimately slowing you down. If you’re setup allows, a single center fin would be perfect for flat water riding. Using all 3 will allow you to turn faster and is more appropriate for riding in swells and waves. Paddles are fairly standard but they can be made of different materials like carbon, Kevlar, aluminum, and fiberglass. The carbon ones are the most durable, light and expensive, and are followed closely by the fiberglass and kevlar ones. The aluminum ones are a bit heavy and tend to sink, but are pretty affordable. Something not to be underestimated. You will have to pump your board every other time, so it’s key you get a high-quality one. Most pumps are the same and will require between 5-12 minutes of pumping. However, some boards like the Bluefin, come with a dual pump that makes the pumping process a lot easier and faster. The above said and done, some people go on to buy cheap car pumps or electric inflators for an easier time. Having the right bag really opens up where you can take a paddle board. Those beautiful lakes inaccessible by car can now be reached with you simply carrying your board on your back. The bag will be heavy but if you get a comfortable one, it will make your journey a lot easier. What Makes Up a High-Quality Paddle Board? A high-quality paddleboard is one that works best for your needs. You can have the best of the best, but if it’s not right it will feel clunky, unbalanced and uncomfortable to ride. You typically have 3 main types of paddle boards; there are short (under 10 feet), medium (10 feet to 12 feet) and long (12 feet to 14 feet). The short ones are better for kids and for surfing. They are more maneuverable and give you better control over waves and choppy water. However, they are too “twitchy” and don’t provide a very relaxing ride. The medium boards are pretty much great for all around use and offer the best of both worlds. The longer ones are the best for fast paddling and travel of long distances. Finally, another thing to consider is the width. The wider a board is, the more stable and comfortable a beginner will feel on it. However, smaller people can feel fairly comfortable on narrower boards. We chose inflatable SUPs because they are simply better value for money when it comes to beginners. When you’re starting out in a new sport, it’s simply not a good idea to go all in and buy “the best gear”. Firstly, because the best gear will be very expensive and in the case of paddle boarding nearing the thousands, even a standard solid SUP will set you back quite a bit. Secondly, because you simply won’t be able to appreciate the quality without any reference experience. They are more durable than hard SUPs and can take quite a few bumps. They are easy to pack, store and carry around with you. The clear winner for me was the SBBC Ultimate Deluxe Package. It’s an option that doesn’t break the bank and that gives a lot of value. The durable and stiff triple-layered PVC construction, the high-pressure dual pump, and the detachable fins all make it worthwhile for me and they would be worthwhile for you too. The price allows you to have a bit of money left over so you can buy upgrades as necessary.